After Sweden’s legislative elections on Sunday did not produce a decisive result, Nicholas Aylott, associate professor of political science at Södertörn University, shared his views what the voting outcome means. Via The Local. As expected, neither the centre-left nor the centre-right bloc obtained a majority in Sunday’s vote. 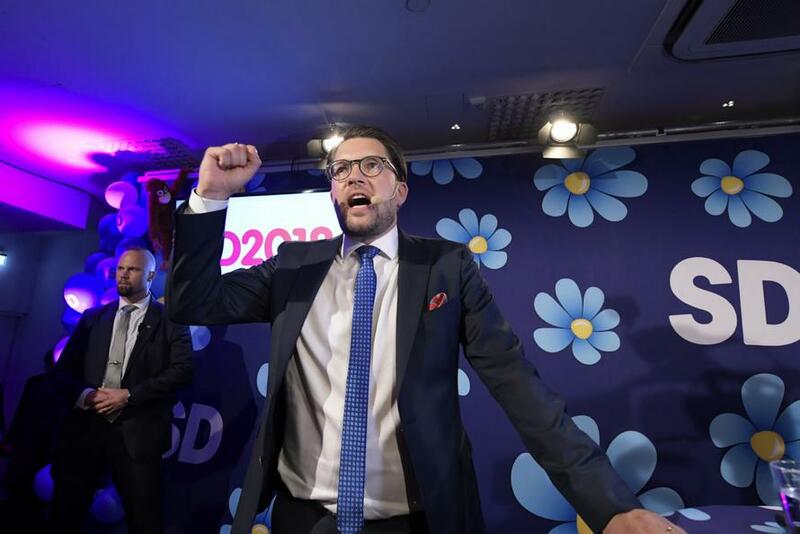 The far-right Sweden Democrats solidified their position as the country's third-biggest party with a vote share of 17.6 percent at the latest count. That is a lower score than several polls had predicted for the right-wing populist party, but still sees a significant growth in its voter share and number of seats from the last election in 2014. Social Democratic Prime Minister Stefan Löfven's red-green left bloc currently has a razor-thin one-seat lead over the centre-right opposition Alliance, with nearly 200,000 ballots from Swedes who voted abroad still to be counted on Wednesday. Both the Social Democrats and the Moderates, the two largest traditional parties on the left and right respectively, saw their share in the vote shrink from the numbers they posted in 2014. Political scientist Nicholas Aylott, an associate professor at Södertörn University, shared his views how the provisional result changes expectations. Does this result change any of the parties’ pre-election positions? “The results for the Sweden Democrats don’t really change that much as far as the other parties are concerned. Whether they were the third biggest party or the biggest party is less important than the fact that they are now sufficiently strong to deprive either of the traditional blocs of a majority. Why are the Sweden Democrats, the third-largest party, still unlikely to be involved in government? “It’s pretty much inconceivable that the left bloc would be prepared to accept that (Sweden Democrat) support or govern with that support. The really sharp dilemmas are faced by the four parties of the centre-right, the Alliance parties. In principle, they could take over power tomorrow – or as soon as parliament reopens – if the four of them were prepared to reach some sort of, even vague and implicit, accommodation with the Sweden Democrats. The trouble is, the two centre-most of them [the Centre and Liberal parties, ed.] have said that they will not under any circumstances consider that. What about a right-wing government excluding the two smaller centrist parties? How significant is the tiny difference in vote share between the two blocs? “This is where it gets very interesting. For a start, we should say that the result is not yet in. The votes of Swedes abroad have not yet been counted, there could be 200,000 votes and we won’t get the final vote until Wednesday, so it really is going to be a nailbiter. “But if, if – if we assume that the result is as it looks so far, and the left bloc has just one more (seat) than the right bloc, that does make a difference, because the Centre Party, in particular, has said time and again during the campaign and said again last night that if the Alliance was to form a government in those circumstances, when the left bloc is bigger, then they would have to get the consent of the left bloc. So it would have to be some sort of government that had the participation or support of the Social Democrats and maybe the Greens too. If the Sweden Democrats were included in the conservative bloc, there would be a large conservative majority in this election. What is preventing the traditional conservative parties in Sweden from working with them to form a government? “The biggest factor is that the Sweden Democrats are a very different party with a very different background to, let’s say, the Progress Party in Norway, and even to the Danish People’s Party. They’re not a very old party, they were only formed at the end of the eighties, and they have roots in overtly racist, Neo-Nazi organisations. That history means something, no matter how much the party professes to have changed and maybe really has changed, that background means something and it makes it more difficult for mainstream parties to consider treating them as a normal party. “But of course you have to think about the nature of political debate in Sweden, and the parameters of what can be said at any time. What is considered legitimate and what is considered illegitimate to say and do are relatively narrow in Sweden, particularly on some questions. And so those two factors have really served to underpin the isolation of the Sweden Democrats.